By Andrew Porter: According to Reliable Sources, Robert Silverberg, in the United Kingdom to attend World Fantasy Convention, had a heart attack on October 29, and had a stent inserted. He was discharged from hospital on October 30th and was reported resting at his hotel. He is due to return to Oakland on Monday; he will not be attending World Fantasy Convention. DC Comics will move to Burbank in 2015 , already home to its digital and administrative divisions. Author Ray Bradbury’s family and his longtime friend Donn Albright recently donated collections of Bradbury’s manuscripts and letters, along with furniture and other items to the Center for Ray Bradbury Studies at Indiana University-Purdue University Indianapolis. “We plan to reconstruct Mr. Bradbury’s home office as it existed in the mid-1960s, at the height of his power as a creative writer and cultural visionary,” said Jonathan Eller, Chancellor’s Professor of English at IUPUI and director of the Bradbury center. The writer left his manuscripts and author’s copies of his books to Donn Albright, his principal bibliographer and a Pratt Institute professor. In turn, “Donn, a native Hoosier, has graciously donated most of these books and papers to the Bradbury center,” Eller explained. The Bradbury family made a complementary donation of the furnishings, correspondence, awards and mementoes from Bradbury’s home office. Many artifacts representing Bradbury’s strong influence on America’s space program are also included in the Bradbury family gift. Albright’s gift, to be known as the Bradbury-Albright Collection, will be the centerpiece of the Bradbury Memorial Archive at the Center for Ray Bradbury Studies. The IU School of Liberal Arts will catalog and store most of the items until the Bradbury center is able to expand its space to accommodate the new holdings. A few items will be on display in the center offices until then. The Center for Ray Bradbury Studies is a research component within the Institute for American Thought in the IU School of Liberal Arts at IUPUI. The center opened in 2007 with the goal of providing an archive for Bradbury’s writings and a library of related reference books in the fields of fantasy and science fiction. Shipment of the Bradbury items to the IUPUI campus this month coincided with a shipment of Bradbury’s home library and related materials to the Waukegan Public Library in Illinois, a donation representing the author’s wish to leave his hometown with a significant portion of his literary legacy. Waukegan Library staff and the IUPUI center worked closely throughout the summer to coordinate the shipments from Bradbury’s Los Angeles home. 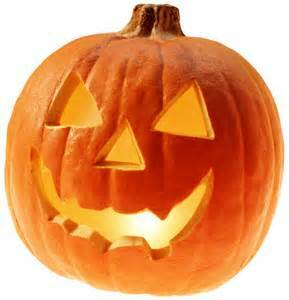 Here are four links for this spooky holiday. (1) The Hollywood Reporter’s film critics have compiled their picks for the 20 scariest movies of all time. Science fiction thrillers Alien and 28 Days Later made the list. (2) Anne Rice will be on The Late Late Show with Craig Ferguson tonight…talking up her new werewolf book. (3) You might be frightened by what they’re serving at the drive-thru says James H. Burns in ”Fast Food and the Kitchen at Frankenstein’s Castle” at The Thunder Child. But I could not sell it. All I could imagine was that no editor knew that the cited material was true, OR that they disliked what you’ll see is my science fictional ending (but one which I believe!). In any event, I think you’ll get a kick out of some of the neat 1960s and ’70s images. 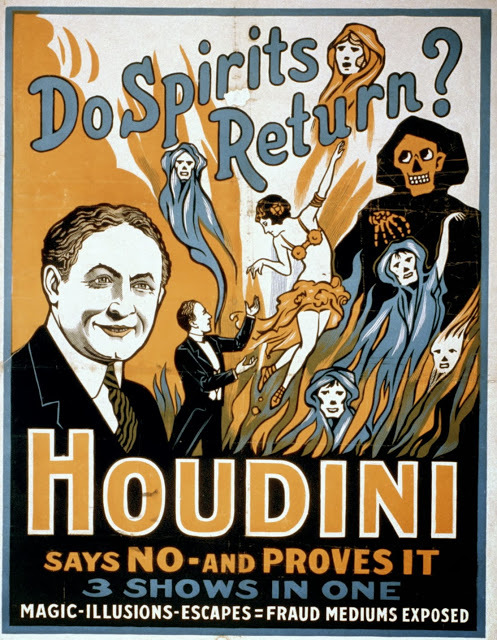 (4) And can Halloween be really complete without a tribute to Houdini? He died on this date. UK writer Brian Sibley has posted “Are You There, Harry Houdini?”, a half-hour radio show first broadcast on the 70th anniversary of Houdini’s death in 1996. Throughout his life, Harry Houdini diced with death – accepting challenges to undertake life-threatening stunts and dangerous escapes. Following the death of his beloved mother, he sought to discover whether there was a means of contacting the departed: a quest that led him to expose fraudulent mediums and spiritualists who faked contact with the dead for financial gain. Recommended: “Endgame: The ‘Unfilmable’ Ender’s Game’s 28 Years in Development Hell” by Matt Patches on Grantland. “I’ve always thought it was going to take years to get this movie made because it’s going to take the fans of the book who read it in their wonder years to grow old enough and be in positions of decision-making,” said Lynn Hendee, a producer of Ender’s Game who came onboard the project in the mid-’90s. Hendee was right. Jenni Merrifield of Port Moody, British Columbia and Pablo M.A Vazquez III of Austin, Texas have been awarded C$500 scholarships by CanSMOF Inc. to help defray the cost of attending SMOFCon 31. SMOFcon 31 will be held December 6-8 in Toronto. 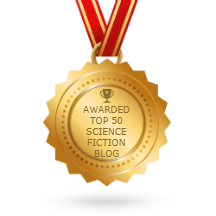 “SMOF” stands for “Secret Masters of Fandom,” a humorous term for people who organize science fiction and fantasy conventions. SMOFCon is the annual convention about organizing science fiction and fantasy conventions. It has been held in different cities around the world, usually in early December, since 1984. 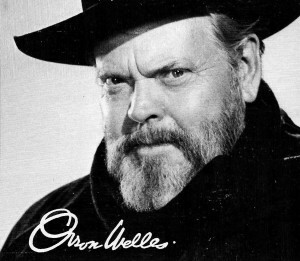 On this day in 1938: The broadcast of Orson Welles’ radio drama, “War of the Worlds,” caused a national panic. Robert A. Heinlein would no doubt be pleased with the idea of being the latest addition to a Hall of Fame whose first member was Mark Twain — a strong possibility since he is leading the field in voting for 2013 additions to the Missouri Hall of Fame. Voting ends October 31. Track the results here. If selected, he will join a wildy varied pantheon already inhabited by Rush Limbaugh, Sacajawea, Walt Disney, Laura Ingalls Wilder, Josephine Baker, Scott Joplin, Dred Scott and Emmett Kelly. The Missouri Hall of Fame was established in 1982 with the induction of Samuel Langhorne Clemens (Mark Twain). All previous additions were made by the Speaker of the Missouri House of Representatives. This year, for the first time, voters in an online poll will pick two inductees from a slate of 10 nominees, while Speaker Tim Jones will choose a third. Speaker Jones denies the rules change has anything to do with protests about last year’s choice, Rush Limbaugh. Born in Butler, Missouri, Robert A. Heinlein is considered one of the greatest American Science Fiction writers of the 20th century. A famous and bestselling author in later life, he graduated from Annapolis and served in the Navy before being forced to retire because of tuberculosis. Heinlein’s most famous works include the Future History series, Starship Troopers, Stranger in a StrangeLand, and The Moon is a Harsh Mistress. I find it interesting how many 2013 nominees for the Missouri Hall of Fame are strongly aligned with political and cultural views that were anathema to your average Missourian – not only during the nominee’s lifetime, but a lot more recently than that. Sue Shear served 26 years in the Missouri House of Representatives and is best known for her very first bill — introducing the Equal Rights Amendment in 1973 — which she reintroduced every year until 1982 when the ratification deadline passed. John Brooks Henderson was a United States Senator from Missouri and a co-author of the Thirteenth Amendment permanently prohibiting slavery in the United States. Virginia Minor launched the woman suffrage movement in Missouri in 1866. Obviously, the Hall of Fame says as much about the state’s aspirations as its past. Other 2013 nominees are two composers, a pro golfer, and the artist whose work inspired the Kewpie doll. Trailing Heinlein in the voting, in second place, is the founder of an osteopathic school. The Missouri Hall of Fame is enshrined at the capitol building in Jefferson City. It includes bronze busts of the 41 people on the list of Famous Missourians. Update 11/01/2013: Corrected name of current Speaker. A year ago today Hurricane Sandy made landfall. What’s the weather like today, James H. Burns? Amazing to me, to think just one year ago, Sandy had already begun to hit us here on Long Island. 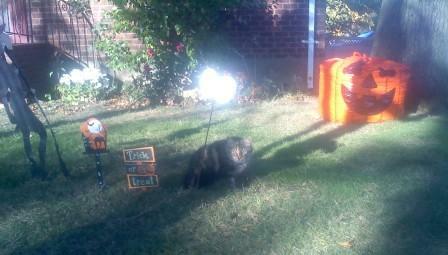 (And that’s Betina Blackjack, one of — I suppose you could say — my Heinlein cats!) This afternoon, as you can see, it’s serene. Betina Blackjack. Photo by James H. Burns.